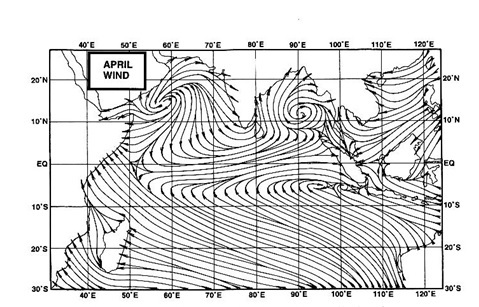 Mumbai being coastal station sees reduction in temp as sea breeze tried to peep in earlier today compare to yesterday. While Interior N. Konkan got roasted in heatwave with further rise in temp today and also witnessed highest temperature of 2018 till now ! Bhira town in Raigad Dist at base of Tamhini ghat was hottest place in India as recorded max of 45℃ today!! It is also a first 45 C mark temp of India for 2018. 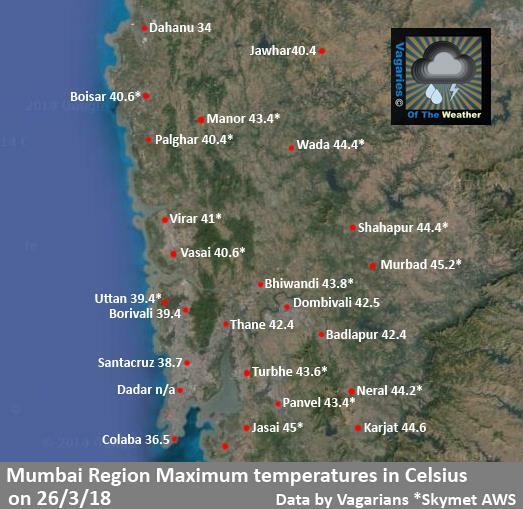 Below Map will give the idea of how the temp behaved in N.Konkan today. When are the temperature and heatwheatwave easy down.. The El Niño–Southern Oscillation (ENSO) remains neutral—neither El Niño nor La Niña. The ENSO Outlook is INACTIVE, meaning there is little sign of El Niño or La Niña developing in the coming months. Oceanic and atmospheric indicators reflect this neutral state. Sea surface temperatures remain cooler than average, but within the neutral range. However waters beneath the surface have warmed, and will likely extend to the surface in the coming weeks to months. In the atmosphere, trade winds and cloudiness patterns are near normal, consistent with a neutral state. Although the 30-day Southern Oscillation Index (SOI) has bounced back into the La Niña range, this is a result of transient tropical systems, including tropical cyclones Marcus and Nora, and doesn’t reflect the broader climate state. Most international models surveyed by the Bureau indicate the tropical Pacific Ocean is likely to remain ENSO-neutral through the southern hemisphere autumn and into winter. A neutral ENSO pattern does not necessarily indicate average rainfall and temperature for Australia. Rather, it indicates a reduced chance of widespread very wet or very dry weather, and that other climate drivers may have greater influence over the coming months. The Indian Ocean Dipole (IOD) is currently neutral. IOD events are unable to form between December and April. Four out of six international models suggest a neutral IOD for autumn and early winter, while the other two show a shift towards a negative IOD during winter. A negative IOD during winter tends to enhance rainfall in southern Australia. However, model accuracy during autumn is lower than at other times of year, so these outlooks should be used with caution.